On Saturday March 11th, Vrola – Center of the Plate Specialists were thrilled to join forces with Deb Smith, founder of Jersey Bites. During the N.J. Home Expo we provided a cutting demo with our own Joe Vrola! While there, guests got a glimpse into the world of being one of New Jersey’s top providers of quality and service. Joe took listeners back to his early days starting out, working alongside his father in the family run Jersey City butcher shop, where he learned how to cut meat, choose only the best cuts, and cook the entire animal. Joe provided guests with a cutting demonstration of a whole strip, as well as picking a member out of the audience to assist! With his familiarity of the product, he was able to explain to the audience the versatility of the Strip with ease. 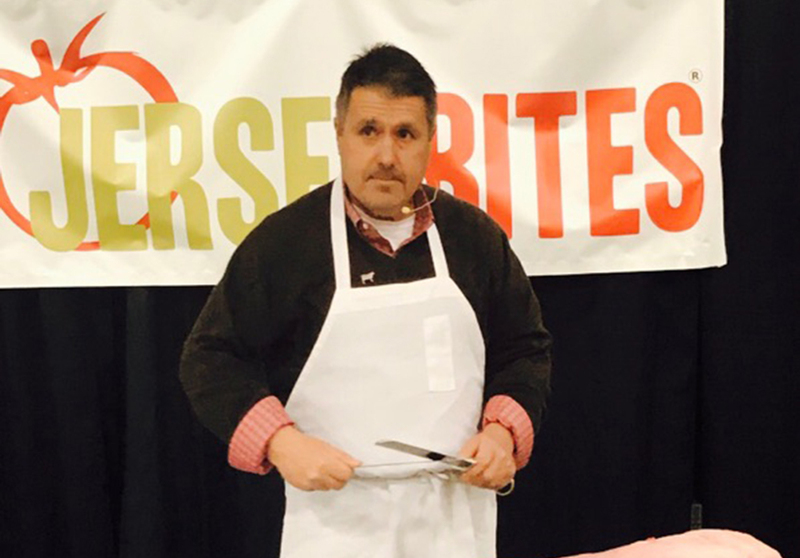 Robert Johnson, our own Corporate Chef and Sales Executive worked alongside Joe, cooking and providing the audience with samples of braised Applewood bacon. The aromas drew in even larger crowds, and as usual, Robert didn’t disappoint with his incredible culinary skills that delighted everyone. Audience members also left with a copy of Robert’s recipe, so they are able to recreate this delicious bacon in the comfort of their own kitchen! It was an informative, delicious and enjoyable day. As your Center of the Plate Specialists, we look forward to cooking up even more great times together!